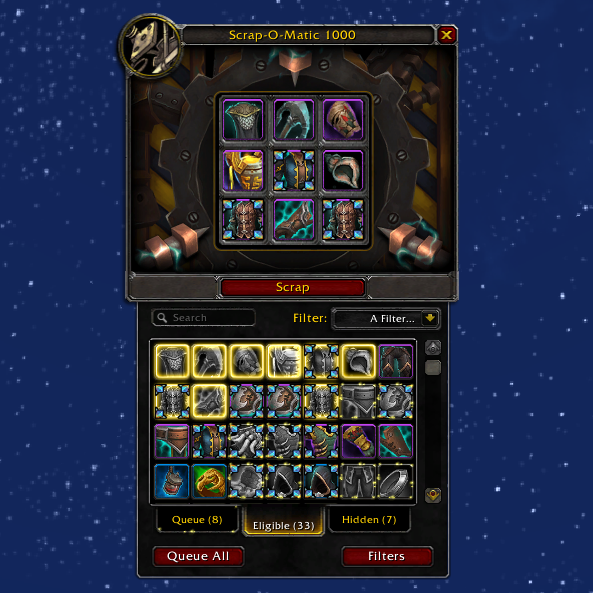 Easy Scrap adds a new frame to the Scrap interface that shows you all items in your bags available for scrapping and lets you queue items. See all items you can scrap without having to look in your bags and search for even faster results. Queue up items and have them automatically placed into the scrapper when the scrapper is empty again. Hide specific items you do not want to see in the "Eligible" tab by right clicking them. With the default filter automatically hides all gear that is used in an equipment set. Create custom filters to automatically ignore items. Leave a comment if you have a specific filter request. Please report any weird behavior if you see any and always make sure you're not scrapping an item you want to keep. I wanted to have a Queueall makro and I wanted to see how wow Addons work so I played with it and made it work. If you add the following lines after the other button on line 48-50 in EasyScrap.lua you can make the makro /click EasyScrap_Queueall which should do the same as pressing the Queueallbutton. there might be a bug. where one of the EasyScrap is visible all the time and nothing works anymore. However I have reinstalled EasyScrap and then copied the above code into it and it works. Is it possible to keybind Queue All button? I can't say I was planning to unless there's a big demand for it. It wouldn't be too much work to allow easy translation but I'm not sure other languages would fit in the layout. Does this addon keep statistics on the materials returned from scrapping? I'd love to know what the drop rate of expulsom is from certain items - particularly crafted greens and the occasional blue crafted procs. Love the addon, thanks for your excellent work! It does not track the results of scrapping. The adddon "ScrapMaster" does track it and you can use it together with Easy Scrap I believe. I have considered adding it, just haven't gotten around to do it. Glad you find the addon of use! while using with Auctionator addon and Trade Skill Master Addon at the AH i keep getting this error generated from your addon. I think it's fixed in the new version just waiting for curse to approve, I take it you have the option enabled to display whether an item is scrappable when not at the scrapper? Let me know if it still happens once you have the new one! Hi, I love this addon its awesome!!! Can you please make a Ilvl filter example: I can put in tab "ilvl 335" and every piece that have that ilvl or lower will show up? If you only want to see items that have item level 335 or lower you would add the item level filter and then set the minimum item level to 0 and the maximum to 335. If you only want to see items with item level 335 then you set both minimum and maximum to 335. If you only want to see items that are higher than 335 set minimum to 336 and maximum to 999. Hope this helps! Ohhhh sry didnt saw there is an ilvl rule tab sry ^^ and ty! Great addon. Triple thumbs up for the new custom filters. Filter request: The ability to exclude any item that you don't know the transmog for. I have a transmog filter ready for when I upload the next version, sadly it doesn't work 100% on all items. Other addons that deal with transmogging use workarounds to get around this but at this moment I don't really want to set that up with all the headaches that that probably brings with it. It should hide all items of which you haven't added the appearance yet, just for some edge cases it will hide them even if you do have it learned. Could I request a filter to filter by Outfitter outfit? The equipment manager filter is great but it doesn't work nicely with Outfitter accessory/partial outfits that's mostly used for offspec gear. There's an option in Outfitter to store your sets server side, then they should work fine, but you are limited to 10 sets then I believe. That fixed it for someone else at least! Yes but it’s only for complete outfits and not for partials/accessories. Trying to store accessory outfits on server will convert them to complete outfits and would impact my usage and maintenance of my outfits. Thus it would be really useful to have a filter for Outfitter specifically as so many people use that. Well I can't say supporting other addons is on top of the list of things I want to do but I might briefly look into it after I release the fix for the ignore function. It will depend on how Outfitter stores the sets. Ignore list option: only add that specific item to the ignore list (and don't add the other ilvl/socket versions of the item with the same name).